Today, we celebrate Jesus’ gift of His Body and Blood in the Eucharist to His Church and the world. Yet our Gospel takes us back to the feeding of the five thousand. Why? On this solemnity of Corpus Christi, we might expect our Gospel to be an account of the Last Supper, in which Jesus first pronounced the words of institution of the Eucharist. However, St. Luke points us in a slightly different direction. We see Jesus ministering to the large crowds who followed Him, speaking “about the kingdom of God” and healing “those who needed to be cured.” This action is the very essence of what Jesus came to do when He took on flesh and blood. He came to tell us that true human life can only be found in God’s kingdom, not the various kingdoms of history or human culture. He also came to heal us of the great sickness of sin, which so cripples us that even if we perceive God’s kingdom, we are unable to enter it. “The day was drawing to a close,” St. Luke tells us, foreshadowing the time when Jesus’ earthly ministry would end. What would happen to the crowds who had traveled out to this “deserted place” to hear and be healed by Him? The apostles assumed the people needed to leave and go on with their lives: “Dismiss the crowd so they can go.” Jesus has a completely different plan: “Give them some food yourselves.” We shouldn’t miss how outrageously impossible this must have seemed to them. We can feel it in their response—we don’t have enough food here, and we certainly can’t go out and buy it. Did any of them silently wonder why Jesus expected that they could do something about such a significant food shortage? They were just ordinary men; He was the miracle worker. Yet it is clear that the solution to the problem of hungry people at the end of Jesus’ ministry among them was going to come through the apostles: “Have them sit down in groups of about fifty.” They were in charge of organizing the people to receive a meal, sitting. Jesus was not going to set up a bread line and distribute the food Himself, without mediation. Then Jesus takes the food that was offered to Him by the apostles. He looks up to heaven, transforming this episode from being simply the provision of a meal into an action performed in union with His Father. He then blesses, breaks, and gives the food, not to the crowd, but to the disciples. These words are significant in St. Luke’s Gospel, because in his account of the Last Supper, we see the same sequence of blessing, breaking, and giving of food (see Lk 22:19) that will become His Body and Blood. Clearly this links the feeding of the five thousand, which Jesus accomplishes miraculously through the apostles, with the institution of the Eucharist, the miraculous food His apostles will continue to provide after His departure. The mystery of the Body and Blood of Christ in the Eucharist is so vast that it cannot be fully described with only one Scripture passage. Today’s Gospel helps us see one aspect of the Church’s miraculous meal in high definition: Jesus provides the miracle and the apostles administer it. Here is one place we can see why the Church teaches that the Eucharist can only come through the hands of those who have themselves been ordained in apostolic succession. This is Jesus’ plan, not ours. Possible response: Lord Jesus, thank You for giving us Your Body and Blood as our food while we await Your return. Because we are thinking about the Most Holy Body and Blood of our Lord today, our first reading helps us understand better that when Jesus took up bread and wine at the Last Supper, He was acting as a Priest. Melchizedek is a mysterious character who appears only once in Scripture—the first man identified as “a priest of God Most High.” We see that his priestly work was to bless Abram (after he waged a successful battle to liberate his nephew, Lot, from captivity) and to bless God Most High. He is a true mediator between God and man. We see, too, that he brought as his priestly offering “bread and wine.” So important was this historical event for the Jews that when Moses built the Tabernacle in the wilderness (later to be the pattern of the Temple in Jerusalem), God directed him to place bread and wine on a table outside the Holy of Holies (the only spot on earth where God and man met, once a year, on the Day of Atonement). A meal in God’s presence thus became an integral part of the communion of God and man (see also Ex 24:9-11). Possible response: Lord Jesus, thank You for the priests You have given to Your Church, who still offer bread and wine in praise and sacrifice. This psalm of David is full of prophetic vision. David sees a son of his and describes him as “Lord,” because he would be the new king of Israel, to whom David would owe obedience. The “Lord” God would say to David’s “Lord”: “Sit at My right hand till I make Your enemies Your footstool.” This, of course, is a prophetic vision of Jesus, Son of David. 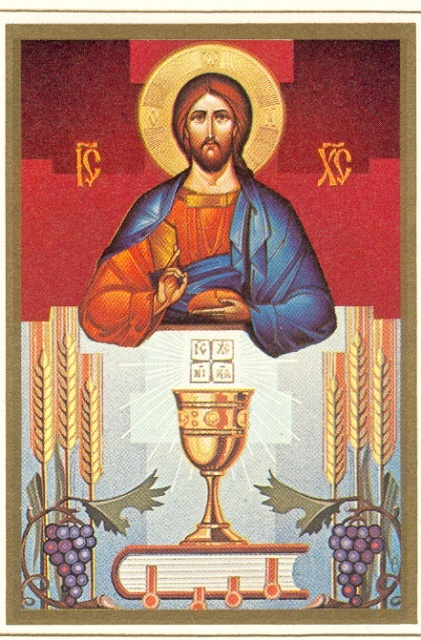 Of interest to us is the prophecy concerning this Son’s priesthood: “You are a priest forever according to the order of Melchizedek.” Now we see more of the significance of Jesus taking up bread and wine at the Last Supper. Jesus is fulfilling this prophecy of His priestly vocation. In the Tabernacle and Temple, bread and wine, as well as animals, were offered up by the Levitical priests, descendants of the tribe of Levi who had been ordained at the time of Israel’s great apostasy. However, the first and best priesthood was of the order of Melchizedek. Jesus took bread and wine and transformed them into the one offering that saves us all, His Body and Blood. No need for any more animal sacrifices, because Jesus became the Passover Lamb Who takes away the sin the world. St. Paul helps us bring together many of the great truths we celebrate in today’s Solemnity. He shows us that Jesus’ provision of a miraculous meal for His people to celebrate His presence with them and to continue to teach us about His kingdom is, in truth, an offering. The offering He made of Himself on the Cross on our behalf is joined to our own offering of bread and wine to God to become the perfect sacrifice, as well as food for the soul. We also see that the Church repeated the action of the Lord’s Supper from the very beginning (see Acts 2:42). 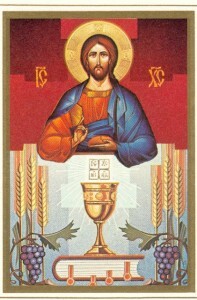 The transformation of bread and wine through the hands of the apostles’ successors continues to be the center of Christian worship—the way we remember and “proclaim the death of the Lord until He comes.” Every Mass offers us this supernatural (and seemingly impossible) communion with our Lord. We have endless reasons to celebrate this today, don’t we? Possible response: Lord Jesus, I know that receiving the Eucharist isn’t meant to produce only an emotion; it is the food that keeps me truly alive. Help me be thankful in a way pleasing to You.